Toys for Tots at The Terrace Tonight! - Yo! Venice! Home Venice Beach California Toys for Tots at The Terrace Tonight! Toys for Tots at The Terrace Tonight! 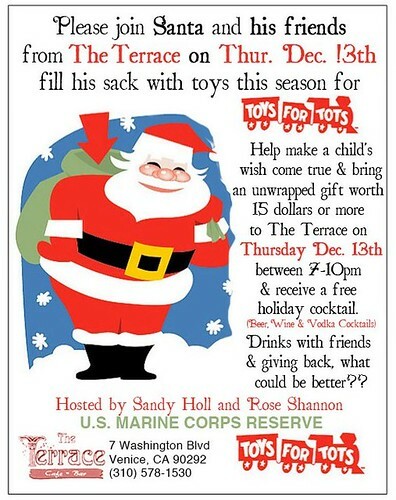 Sandy and Rose will host their annual Toys for Tots benefit at the Terrace this evening between 7-10pm! Help kids that are in need while having fun with your neighbors! Every year this is a very festive event! Bring an unwrapped gift worth more than $15 and you will get a free holiday cocktail!